Trim claws on your rabbits. 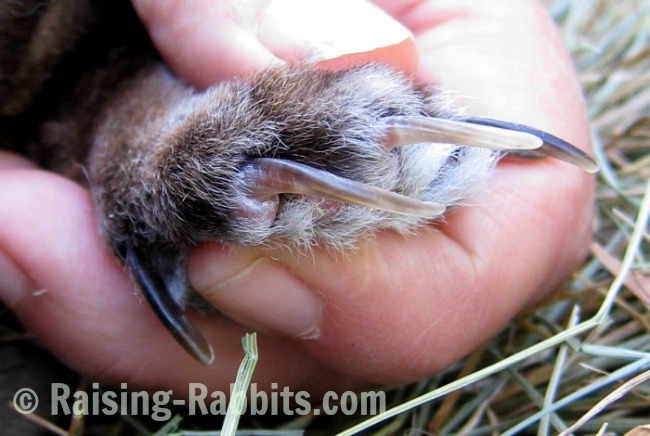 Here is where you'll find easy instructions and pictures showing how to clip the claws of a rabbit. 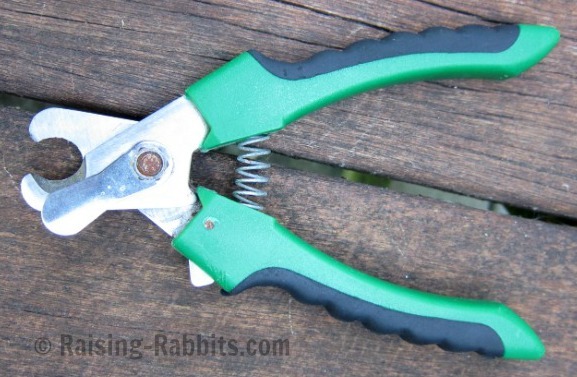 We'll also show you the claw clippers we like to use for grooming rabbits. A rabbit’s activities of daily life can act to sharpen the claws into miniature daggers. Leave these claws unclipped and you may find your own arms fairly shredded and bloody, even when the rabbit you're holding is not panicked. 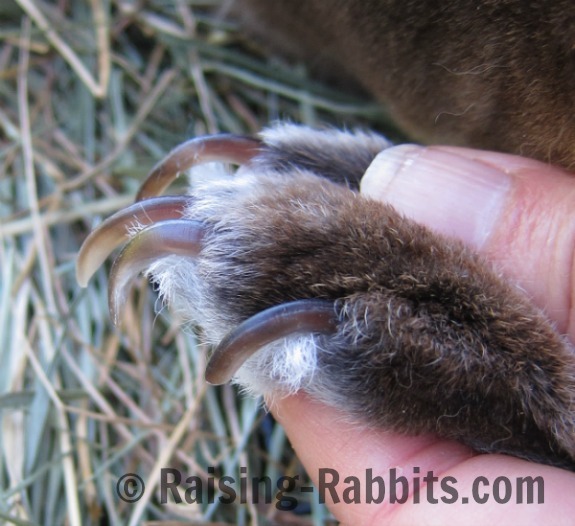 Additionally, the claws curl such that when the rabbit walks on a flat surface, the long nail pushes the toe upward, creating pressure at the far end of the toe’s walking surface. If the fur pad is not dense enough, long nails can contribute to sore hocks on front or rear paws or both. This is a picture of our ‘model’ rabbit’s hind foot. 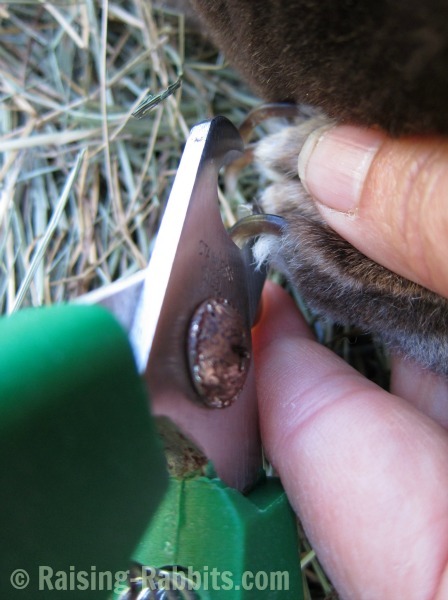 Here’s a picture of the standard animal nail clippers we use. It has comfortable handles, is easy to use, and cuts quickly and sharply. It has a little safety flange which can be moved to limit the amount of nail that can fit into the trimmer. If you can clearly see where the dead claw stops and the living quick starts, it is easy to use without the flange. Pop each claw into the jaws of the clipper and snip them one by one. Easy peasy. Just don’t cut where it’s pink. If you find that the pink quick is quite long, you should still not cut through it. Simply go back a couple weeks later and trim the claws again. By repeating this process as needed, the quick will slowly recede back to the space where it ought to be. In the following picture of the hind paw, we’ve cut the first 3 claws one at a time, and left the 4th claw (temporarily) unclipped for comparison. You can see where the pink quick stops. We cut only through the all-white part of the claw. The rabbit has just 4 claws on the hind paw, but 5 on the forepaws. The 5th ‘thumb’ is easy to miss. In the picture below, it is down by the human’s fingers. 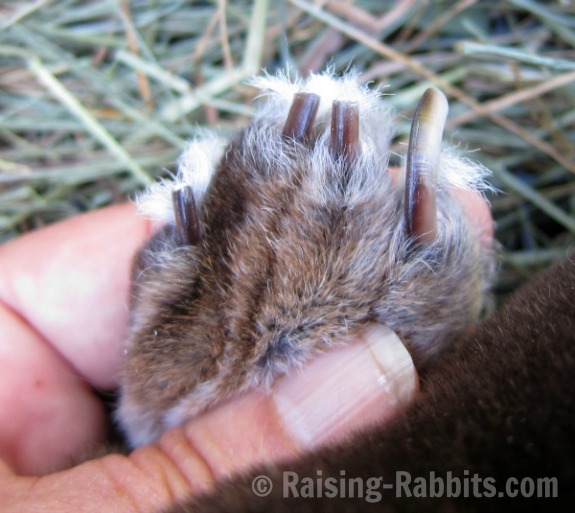 This picture shows clearly where the quick ends and the dead part of the claw begins on the light-colored rabbit nails. 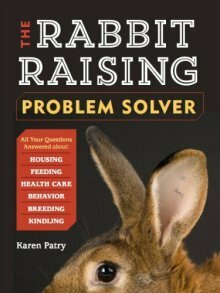 If your rabbit has very dark claws, it may help to find the quick by shining a light behind the claw or taking the rabbit into a brightly lit area. High time to trim these claws! If you trim claws and accidentally nick the quick, the rabbit will let you know by jerking its paw back reflexively. It’ll bleed fairly briskly for a short time. but you don't need to worry too much - it’ll heal without incident, and practice will make perfect. In the meantime, use some styptic powder on the cut to quickly dry up the bleeding from the too-deeply-trimmed claw. Styptic Powder...for when you say, "Ooops!"